Released a few months ago on DVD and Blu Ray from MVD/Unearthed Films is a new Western that takes the formula of the genre and adds many of today's elements to it. I am a big Western fan and this caught my eye for a few reasons. 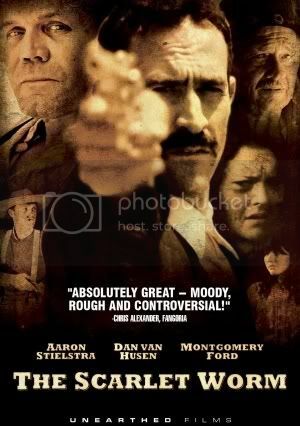 One is the fact it features the star of some great Spaghetti Westerns, Brett Halsey (billed here under his old Western pseudonym Montgomery Ford). Another is the original concept and its controversial nature, which harkens back to another of my favorite Westerns, Lucio Fulci's Four of the Apocalypse. Aaron Stielstra stars as Print, a hitman who works for the aging rancher Mr. Paul (Halsey). Print is hired to mentor a new aspiring gunslinger and the two are to kill a local brothel owner (Dan van Husen) who is accused of giving his prostitutes abortions. Print is also being hunted by a local group of thugs whom want revenge on their friend that he killed. The Scarlet Worm is a welcome addition into the Western genre that has put out very few great films in the last 30 years. The movie mashes the setting and feel of an old Western with the profanity, bloody violence and other R-Rated themes found in today's harder films. The film's cinematography combines stunning images (both beautiful and edgy) with some computer generated FX to make it a blast to watch. Some of the acting was slightly amateurish and some of the CGI was a little over the top but the film overall was a treat for Western fans waiting for a nice violent addition to the genre. Aaron Stielstra did a great job as the lead, though I couldn't help thinking that he reminded me of the Soup Nazi from Seinfeld. The DVD and Blu Ray feature a several features including two commentaries, behind the scenes footage and trailers. Buy the DVD and Blu Ray directly from MVD.